Kortec, the world's leader in high barrier packaging, approached Campden BRI to carry out proof of concept testing for its new multi-layer plastic Klear Can. The Klear Can used was a 73mm diameter can closed with a metal easy openable end using conventional double seam technology. Our cross-disciplinary team of experts carried out rigorous testing of the new can in three key areas - thermal processing, container integrity and compliance testing. The first step was to evaluate the suitability of the container with regard to retorting at elevated temperatures. Using our Lagarde pilot retort we undertook a series of tests which subjected the plastic containers to thermal processing with a range of parameters. The trials indicated that the containers were suitable for retorting under a range of conditions including processing at 130°C. Once the container processing conditions had been established we then undertook integrity testing by means of a biotest. This involved filling six hundred cans with microbiological media, sterilising them, and then immersing them in bacterial culture for 30 minutes before incubation. The cans were incubated at 30°c for a month and examined daily for spoilage. The biotest results showed that the container and double seam closure were satisfactory to ensure the production of safe foods products. It's vital to ensure that any migration of packaging components complies with regulatory limits, so our chemical packaging specialists carried out migration testing using our UKAS accredited method. The tests showed that the Klear Can complied with overall migration limits as defined in EU Regulation 10/2011 for plastic materials in contact with food. 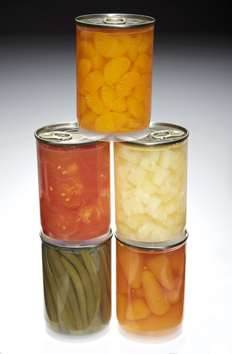 Finally, after all the trials we filled the cans with a range of fruit and vegetables before processing them to meet specific product requirements. The cans were then labelled by Kortec for display before being delivered to Germany for Kortec's Klear Can product launch at Interpack 2014.